This past week I was in New York setting up Identity Tapestry for the BWAC’s Wide Open2 show (juror Nathan Trotman, curator at the Guggenheim, NYC). The show went well and once again it was wonderful to watch people interacting with the piece. Many people mentioned that they found it challenging, that it asked them difficult questions or made them look harder at themselves than they were used to. I’m glad. It was a large part of the point. 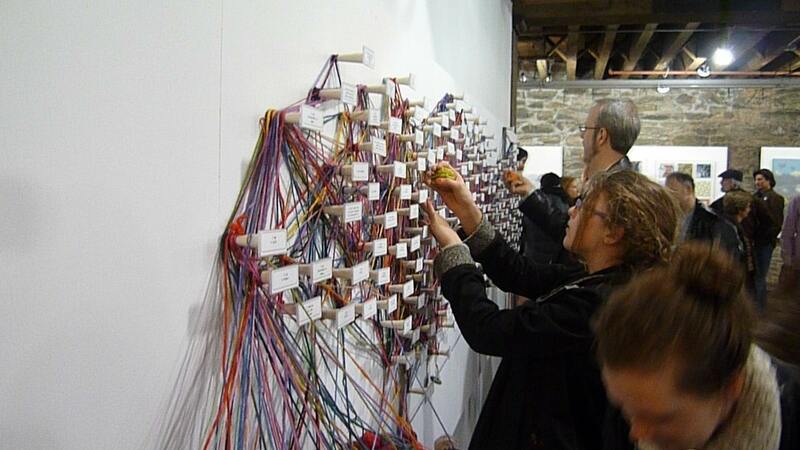 Nathan Trotman awarded Identity Tapestry “Best Installation” for the show. He also commented on the narrative nature of the piece. Stepping back for a moment it is obvious to me as another quality that is entering my work more and more. My upcoming installation at the Textile Arts Center definitely has a narrative quality, as does a collaborative photo-weaving on the drawing board. The response that I got a lot of this time besides praise was “that was hard” and “this made me look harder at myself than I usually do and I’m not sure I like all I see”. I’m glad. This is what art is for, or part of it. TO hold up a mirror that makes people see themselves and each other in a new way, to create a transformative experience… this is what I do my work for. I was also struck by the New-Yorkness of the emerging layout. Culture and family seemed much more important than race to most people, while in San Francisco it was nearly equal (though that could have been the demographic of those attending the gallery). The really New York thing I saw was the focus on intelligence, education and reading. It seems tied into the city’s identity, while more whimsical statements “I love costumes” “I like to pretend” “I am silly” were mobbed in SF and sparce in New York. It is a local cultural identity thing. SF is actually slightly more educated (more higher degrees per person) than New York, the most educated city in the country… but it is certainly also more whimsical, and the highly intelligent and well educated perople there (“geeks”) are more likely to play with legos or juggle than attend cocktail parties, so maybe it’s not a such a surprise. This piece is new and different each time I do it, a bit on my end, but always on the part of participants. I love watching it. I will be putting up a short video montage and images of this iteration on my website soon. Previous iterations can be seen here.